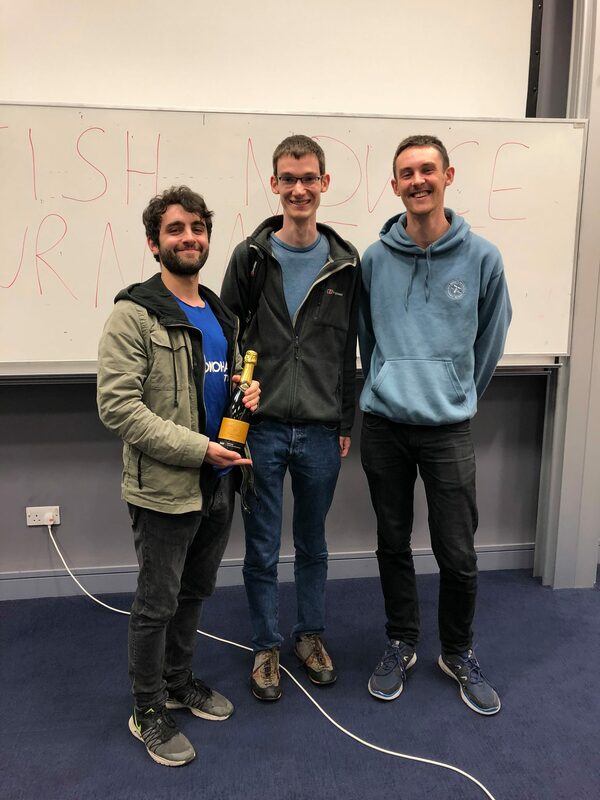 On Saturday, November 17th, 17 teams made the trip to compete at the British Novice Tournament: 10 of them, to Imperial College, London, and a further seven to the University of Glasgow. Universities at this wholly UK-written tournament were Oxford, Cambridge, Oxford Brookes, Imperial, Southampton, Warwick, Edinburgh and Glasgow, as well as two combined teams: one, called Chimera, included players from Oxford Brookes, Oxford and Cambridge, while the other, called Miscellaneous, consisted of students from Glasgow, Strathclyde and Dundee. In London, the 10 teams played a full round robin, which was exciting from start to finish. Oxford Brookes, Oxford and the Chimera team all got off to a strong start, winning all their game in the morning. At the same time, traditional powerhouses Cambridge lost their first two matches, but recovered to win the last three before lunch, which meant the afternoon looked like it would be extremely tight. It very much proved that way, with Cambridge steamrolling their way to four wins a row. At the same time Brookes lost to Oxford, who then lost to the Chimera team. With the Chimera team losing to Brookes, this mean that Oxford probably needed to win their game against their old rivals Cambridge in order to make a final. They didn’t quite manage it, losing 340–180 meaning that they were relying on Imperial B, who had won one game all day, to beat the Chimera team. Imperial came extremely close, only losing by 10 points, but this meant a final between the Chimera team and Oxford Brookes for the title. In the final, Kirsten Etheridge performed brilliantly to go 7–0 to take Brookes to victory, wise Nick Wise of Cambridge also scoring an impressive 50 points for the Chimera. Oxford Brookes Quiz Society was only set up a few years ago, and this was the first quizbowl tournament that the university have won. This serves as evidence that the hard work of setting up and running a quiz society is worth it in the long run (for a bigger picture of the development of Oxford Brookes quizzing through the years, check out this blog post by Tom De Bock). Congratulations to them, as well as to Ruairidh Forgan, Nick Wise and Alex Hardwick, who were the top three scorers on the day. An exciting day was had by all in Glasgow, too. The teams also played a full round robin in the first half of the day, with no team winning or losing all their games, after which they were divided into two brackets: four teams with best records each played a further three matches, while the remaining three teams each played twice more. 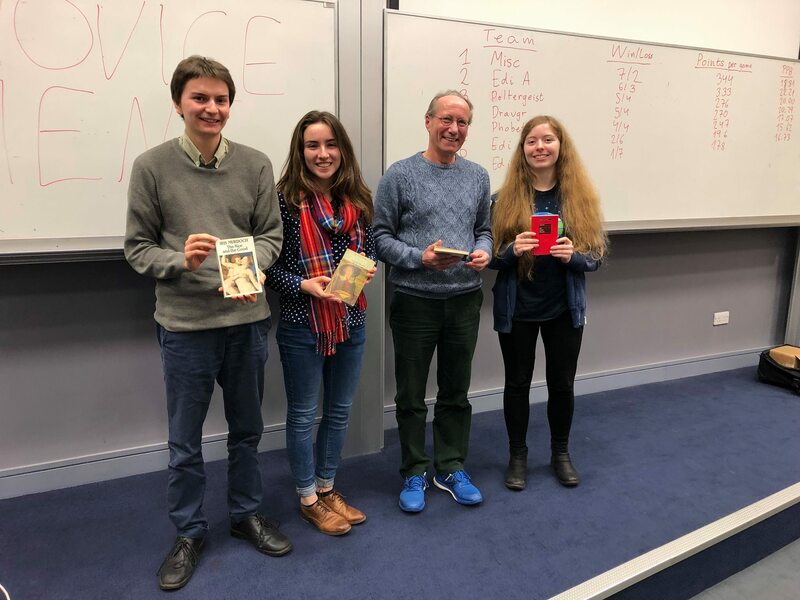 After the round robin, Miscellaneous and Edinburgh A each had won five games, with Jack Pollock of Strathclyde having multiple very impressive games with a personal score over 100 points for the former team; two Glasgow teams joined them in the upper bracket. The all-star team of the Glasgow venue: Cam Herbert, Niamh Clarke, Richard Moon, Freya Whiteford. The winners of the Glasgow venue, Miscellaneous: Rory McDowell (Dundee), Jack Pollock and Chris Cox (Glasgow). It was to the credit of all the teams that took part that at both venues, every single one of them won at least one match in a strong field. British Novice–2018 is proof that the UK circuit is going from strength to strength, and we hope to run an even bigger and better event of the same kind next year (or, possibly, next term!). A special thank you to everyone who wrote for and edited this tournament, and we look forward to seeing you all next year! Links to the statistics are the following: London (round robin only); London (round robin and the final); Glasgow (round robin).